Powered directly from the USB port. 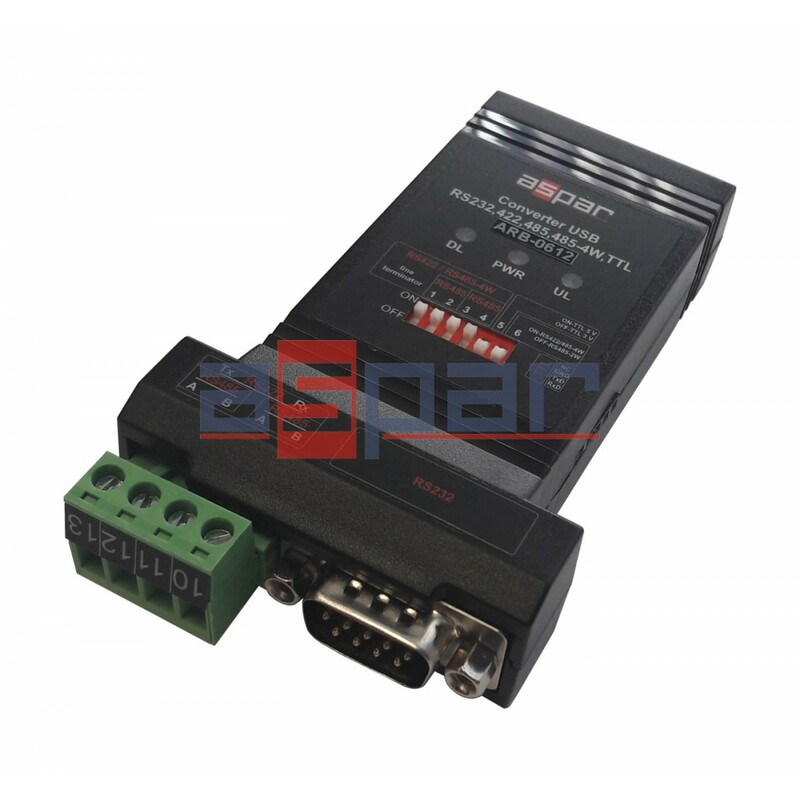 The converter supports two RS485 standards (2-wire and 4-wire), can act as HUB USB to 2xRS485 2-wire. Works with 32 and 64 bit operating systems. Remember to use the appropriate drivers. The device is intended for the USB 2.0 standard. When connected to the 3.0 standard, the converter works as if it was connected to the standard 2.0. It is possible to choose one of four serial transmission standards, i.e. RS232, RS422, RS485 or TTL. The converter provides 3,0kV separation between the USB port and the other serial ports. In addition, the RS422 and RS485 port has overvoltage protection. The operating system creates a virtual COM serial port that can be used by applications as an ordinary COM port. The user has the option of assigning a different COM port number than the one that automatically assigned the system. All parameters of the COM port (for example: baudrate, parity check), are determined by the application using the converter ARB-0612. The USB converter ARB-0612-3,0 provides 3,0kV separation between the USB port and the other serial ports. In addition, the RS422 and RS485 port has overvoltage protection.